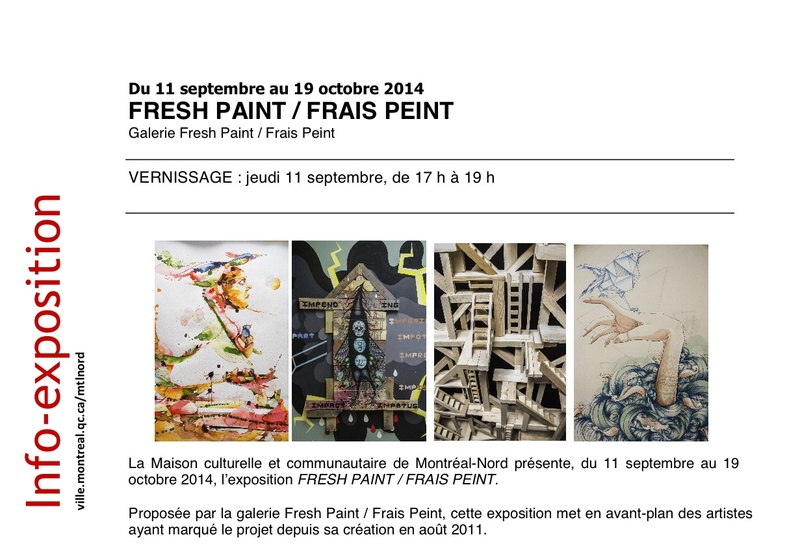 Cultural and Community House in Montreal North has, from September 11 to October 19, 2014, the exhibition FRESH PAINT / FRESH PAINT. Proposed by the Fresh Paint Gallery / Fresh Painted, this exhibition brings to the foreground the artists who marked the project since its inception in August 2011. Strongly influenced by graffiti and street art movements, artists remain true to these cultures present works great and small format, pop aesthetic. They use unusual materials and a variety of mediums to express their pictorial language. The exposure of cultural and community room house welcomes new emerging artists with a unique language. They call XRay, Isaac Holland, MonstRs, HoarKor, Adida Fallen Angel, missme, Carolina Espinosa, Gawd and Mc Baldassari. They are inspired by the hip-hop culture and that of the street, taken from different cultures and symbols of everyday objects. They are in their art a sense of community and strong voice, color and passion. 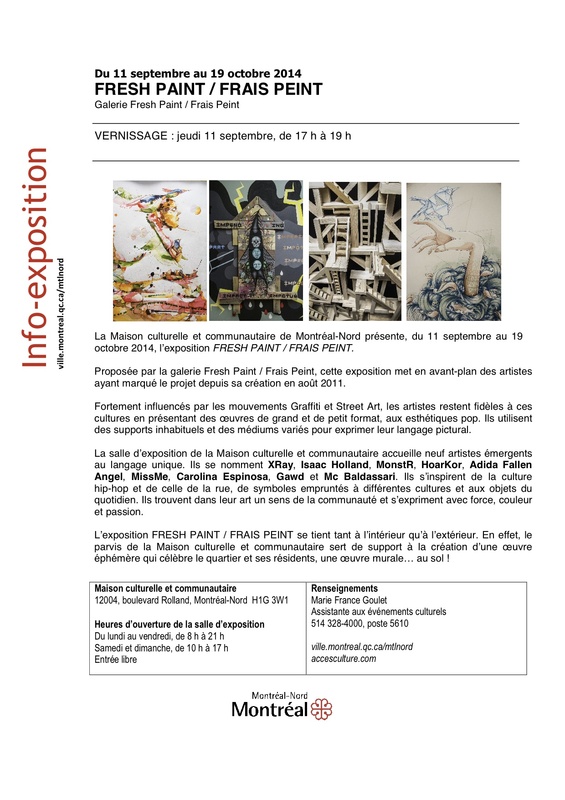 The exhibition FRESH PAINT / FRESH PAINT is held both indoors and outdoors. Indeed, the court of the Cultural and Community House provides support for the creation of a celebrating the neighborhood and its residents ephemeral work, a mural … the ground!